The Crane is set for construction. As you make your way through Columbus via the 670/71 interchange, it’s hard to miss the iconic Smith Brothers Hardware Building. This historical Columbus landmark will be expanding by one story with the addition of a one-of-a-kind roof top patio and event venue. The popular Dock 580 adjacent to the Smith Brothers Building, will be expanding operations into the new space with what will pair some of the best urban catering with the best view of the Columbus skyline. The rooftop patio will be the first of its kind in Columbus, although extremely popular in other cities across the nation. Building owner and developer, Capitol Equities has been planning for the roof top expansion since the building’s initial renovation in 1997. Now, 20 years later, plans and construction for that vision are moving forward on a 12,000-square foot roof top venue and banquet hall. To make the vision a reality, Architectural Alliance has designed the space to capture to skyline view of Columbus, and give guests a unique experience, both indoors and out. 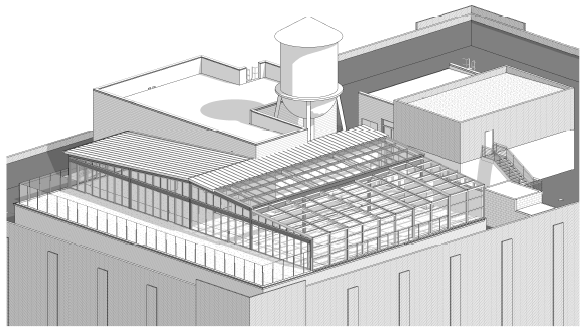 The rooftop venue, will include a full kitchen and bar area, making it an ideal space for weddings and corporate events. Compton Construction will be the General Contractor overseeing construction, which will start in April. 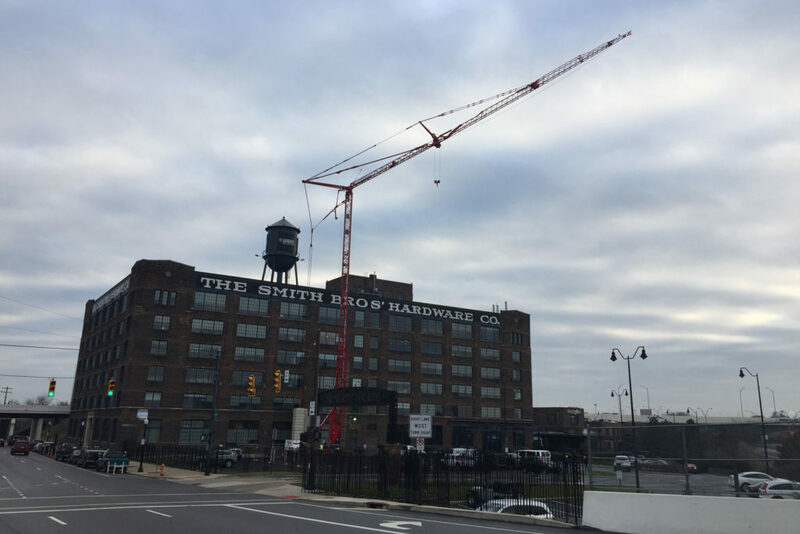 A 130-ft. crane will be used to erect the new venue on top of the building, and transport all materials to the top of the building. The project will take approximately 5 months to complete, and the space is scheduled to open in the fall. Fun Fact: With the crane used on this building fully erected, it makes for the most cranes ever set up in Columbus, Ohio at one time. This summer be sure to keep an eye on the transformation as you pass by along 670. As construction moves forward, the individual parties of the project team will release further information, including exclusive video content and specific venue details. Check out the Before Video on Youtube! For more information, please contact the appropriate company below. Beginning as Zuppa Catering, a small soup & sandwich place, we have evolved into one of downtown Columbus’ most unique, urban catering companies, now called Dock580. Working out of the historic Smith Bros’ Hardware building, our talented staff of planners and chefs take pride in crafting elegant dining experiences for our clients. We believe that a better approach exists. In 1997, Capitol Equities was launched to create a team unlike other real estate agencies. Since that day, we’ve been tearing down the walls of tradition to build something organic. Our first project, the redevelopment of the Smith Bros’ Hardware Building, was, and is, our calling card to the community; we’re here to do things differently. Our agents work together in the best interest of our clients. Consistently, we apply creative vision to repurpose old buildings into spaces with new life, or structure nontraditional deals on behalf of tenants. We pride ourselves on the open and collaborative environment we foster; both within our team and with our clients. Everybody has a source of inspiration to accomplish what they desire to do with the utmost passion. Our inspiration is creating architecture that not only fulfills purpose as a building but establishes a visual inspiration for all those who experience it. Architectural Alliance has been around since 1980. Like anyone else, we started small with just a couple of guys in a cramped office. Our work was well received in those early years, and strong relationships with repeat clients put us in a position to grow steadily through the years. Every project is a new set of issues to tackle and a new future to design. From developing prototypical designs to family-owned stores we’ve pushed hard to make private entrepreneurial clients our only work. Compton Construction is a creative and collaborative design build construction company based in Columbus, Ohio. With a focus on building remarkable solutions for our clients across industries – including retail, breweries, coffee roasters, office spaces and more – our integrated approach to construction helps emerging businesses design and create environments that bring brand experiences to life. Compton’s strong partnerships with clients, subcontractors, suppliers, other project stakeholders and the community put Columbus’ top brands, buildings and projects on the national stage.